The Tallahassee Real Estate Blog has focused heavily on facts and trend analysis rather than purely experience and opinion due to the extreme nature of the current trends in the real estate market. It seems that extreme market cycles create an environment for impulsive optimism or excessive pessimism. 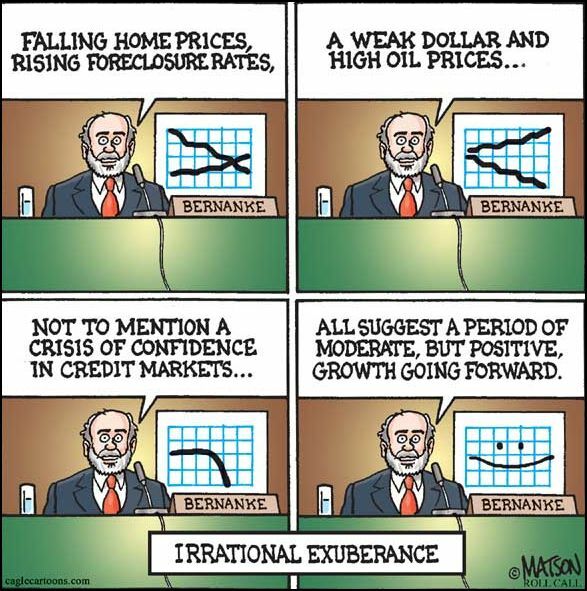 In 1996, Alan Greenspan (Chairman of the Federal Reserve) used the term "irrational exuberance" to explain the crazy optimism that he perceived in the market. I suspect the phrase could also apply to extreme pessimism as well. It is my goal to provide a conservative evaluation of the facts and figures that the market presents without the emotional radicalism that we typically see in mainstream reporting. If you have been reading this blog for any time, you know that I have been encouraging home owners to stay out of the real estate market unless they have a great need to sell a home right now. The "move up" market is a great opportunity for home owners, but I would urge caution to any other discretionary sales until we see housing inventory levels get back to a balanced market for home owners. When we use a term like "120 day trend," we are really saying "for the past 120 days, the average has been ...." Trend reports are excellent market direction identifiers and if you track a long-enough trend, the near future is usually foreseeable. The following graph shows the "120 day trend" for these 4 important housing trend reports. Currently, we are seeing about 19 homes a day being listed for sale in the Tallahassee real estate market. This is 14% fewer than four months ago and 26% fewer than just three months ago. While much of this can be attributed to seasonality, it is nevertheless good news that we hope to see continue through the winter and into spring. The number of homes "under contract" has been falling since the beginning of August, but this is very normal seasonality. I look forward to having enough data to run this graph and these reports on a 365 day trend in order to remove all affects of seasonality. We are currently seeing about 5 homes per day going to a "pending" or "under contract" status. With nearly 3,000 homes on the market, that means each day 1/6th of 1% of the market is being placed under contract. This is one of the main reasons I encourage home owners who are not serious about selling their home to stay away from the market. Much like the "pend" trend, the sales trend is following the normal seasonality curve. 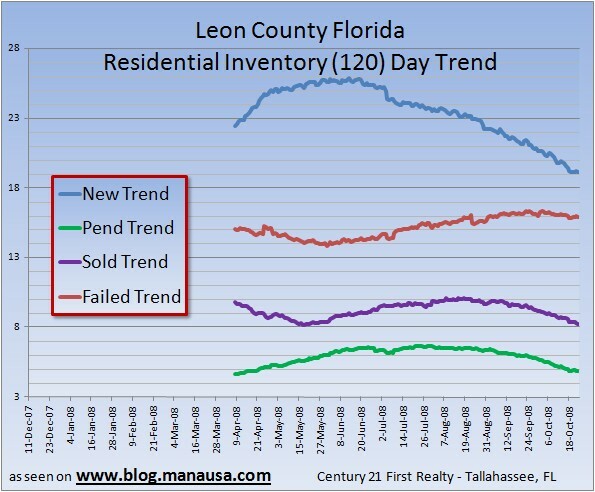 Currently, Leon County is seeing, on average, 8 homes per day sell from an inventory just under 3,000 homes. If you absolutely have to sell your home, you need to understand the competition that you are facing. The current trend of homes failing to sell is also very important to monitor. Typically, these are the homes that we put on the market by people who did not really "have to sell." Currently, we are seeing 16 homes each day "fail to sell," which is an increase of 6% over the past four months. I should hope that this category continues to rise as non-serious sellers leave the market. This will help reduce inventory and decrease the amount of time we need to spend in a depreciating market. If you study real estate market cycles in detail, you can have a good understanding of how long it will take to sell your home and what range of values that you will most likely be competing against. Monitoring these four housing trends are a great minimal starting point to understanding the current movement of the real estate market.